Nor heaven nor earth have been at peace to-night. Neither heaven nor earth have been quiet tonight. Calpurnia cried out three times in her sleep "Oh no, they're murdering Caesar! "—Who's there? Go tell the priests to perform an animal sacrifice immediately, read the signs in its internal organs, and report to me whether or not this bodes success for my endeavors. What are you doing, Caesar? Are you thinking about going outside? You will not go out of your house today! Caesar will go. Things only threaten me when they look at my back. When they see the face of Caesar, they vanish. Caesar, I've never believed in omens, but now they scare me. There's someone here talking about horrible things seen by the night's watch, aside from the things we've already seen and heard. A lioness has given birth in the streets, and graves have opened and spewed forth dead bodies. There must have been a fierce battle in heaven, because blood has been raining down on the Capitol from above. There were sounds of battle in the air, horses were agitated, dying men groaned, and ghosts were shrieking and squealing in the streets. Oh Caesar, these things are not normal, and I'm afraid of them. How can you avoid something whose result is intended by the mighty gods? Caesar shall go forth, for these omens apply to the world in general as much as they apply to Caesar. Calpurnia reminds Caesar of the folklore belief that unusual astrological events, such as a blazing comet, signify a significant political event. But "blaze" also meant to sound a trumpet blast to get people’s attention before making an official proclamation, such as—in Calpurnia's example—the death of a prince. When beggars die, no one sees comets. But when princes die the skies declare it with such signs. Cowards experience death many times in their life, but the brave only experience death once. Of all the notions I have heard of in the world, it seems to me most strange to fear death, given that it's inevitable, and will come when it will come. What's the report from the fortune-tellers? They advise you not to go out today. When they looked inside the bird they had sacrificed, they couldn't find a heart inside the body. If he should stay at home today for fear. That Caesar is more dangerous than he. No, the gods did this to make me ashamed of cowardice. Caesar would be the beast without a heart if he stayed at home today out of fear. No, Caesar will not do that. Danger knows very well that Caesar is more dangerous than danger itself. Danger and I are like two lions born in the same litter, and I am the older and more fearsome one. And so Caesar will go forth. Alas, my lord, your wisdom has been undermined by your overconfidence. Don't go out today. Tell people it's my fear that's keeping you inside, not your own. We can send Mark Antony to the senate to say you are not well today. Please, I’m down on my knee, asking you to have my way in this matter. And he shall say you are not well today. Let me upon my knee prevail in this. And for thy humor I will stay at home. Caesar, all hail! Good morrow, worthy Caesar. OK, Mark Antony will say that I am not well, and to humor you I will stay at home. Here's Decius Brutus, he can tell them that. Greetings, Caesar! Good morning, worthy Caesar. I've come to bring you to the senate. And you've come at just the right time to bring my greetings to the senators, and to tell them that I will not come today. "Cannot" isn't true, and "dare not" is even less true. Just I will not come today—tell them so, Decius. "Cannot" is false; and "that I dare not," falser. I will not come today — tell them so, Decius. To be afraid to tell greybeards the truth? Will Caesar send a lie? Did I exhaust my self in years of battle as to be afraid of telling some old men the truth? Decius, go tell them Caesar will not come. Most mighty Caesar, please give me some reason so I won't be laughed at when I tell them this. The cause is simply my will. My will is that I will not come. That should be enough to satisfy the senate. But for your own curiosity, I'll let you know because I love you. Calpurnia here, my wife, is keeping me at home. Tonight she dreamed she saw my statue running blood like a fountain with a hundred spouts, and many joyful Romans came up to it smiling, and washed their hands in it. She takes this dream to be warnings and omens and signs of evil soon to come, and she begged me on her knees to stay at home today. Lest I be laughed at when I tell them so. Came smiling, and did bathe their hands in it. This dream has been completely misinterpreted. It was a vision of good fortune. Smiling Romans bathing in blood coming from your statue's many spouts signifies that you are sustaining and reviving Rome. Great men will seek blessing from your blood, like pilgrims who dip cloths in the blood of martyrs. That's what Calpurnia's dream means. And you've explained it well. I will have, once you've heard what else I have to say. Know this: the senate has decided to crown mighty Caesar today. If you send them word you aren't coming, they may change their minds. Besides, someone's likely to mock you, saying "Let's break up the senate until another time when Caesar's wife isn't having bad dreams." If you hide, won't they whisper "Why, Caesar is afraid"? Pardon me, Caesar, it's my dear, dear desire for your advancement that makes me tell you this, and observing protocol in addressing you is secondary to this love. How foolish your fears seem now, Calpurnia! I'm ashamed that I was yielding to those fears. Give me my robe, for I will go. And look, Publius has come to fetch me. And reason, to my love, is liable. I am ashamèd I did yield to them. What, Brutus, are you stirred so early too? Welcome, Publius. What, Brutus, you're up this early too? Good morning, Casca. Caius Ligarius, you look quite unwell. I've never been your enemy as much as that fever was that made you so thin. What time is it? Thank you for your trouble and your courtesy. Look, even Antony, who stays up all night partying, is up early. Good morning, Antony. [To Calpurnia] Bid them prepare within. [To Calpurnia] Tell the servants to prepare to leave for the Capitol. It's my fault the Senators have been kept waiting. Now, Cinna, Metellus, Trebonius—I'd like to talk with you for an hour sometime today. Remember to see me today, and stay close by so I don't forget to talk to you. Now, Cinna. Now, Metellus. What, Trebonius! Caesar, I will. [Aside] I'll be so close that your best friends will wish I had been further away. Good friends, let us go in, and have some wine. And then, like friends, we'll leave for the senate. [Aside] That word "like" has two meanings. You think we're going like friends—as your friends; but we're actually going like friends—acting as if we were your friends. Caesar thinks Brutus and the others have come to see him and share some wine “like friends,” i.e. as his friends. 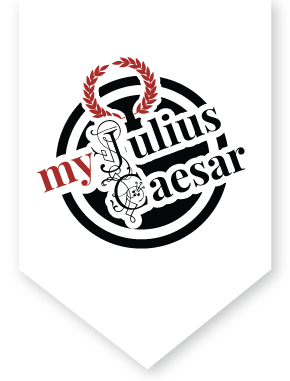 It grieves Brutus that he and the others conspirators must act "like" Caesar's friends, before killing him. Valor. Caesar has not put off going to the Senate, shrugging off the various warnings and bad omens: "Cowards die many times before their deaths; the valiant never taste of death but once." Service to the State. Caesar insisted on hearing all the other petitions before taking up the one which dealt with his own interests: "What touches us ourself shall be last served." Friendship. Caesar is a generous host to the conspirators, even on the day of his murder: "Good friends, go in, and taste some wine with me; and we, like friends, will straightway go together." Respect for the Gods. Caesar orders a sacrifice to the gods before venturing the Capitol to chair a meeting of the Senate: "Go bid the priests do present sacrifice, and bring me their opinions of success." Constancy. Caesar refuses to be swayed by emotional pleas, but sticks to his prior rulings and principles: "Let me a little show it, even in this — that I was constant Cimber should be banished, and constant do remain to keep him so."